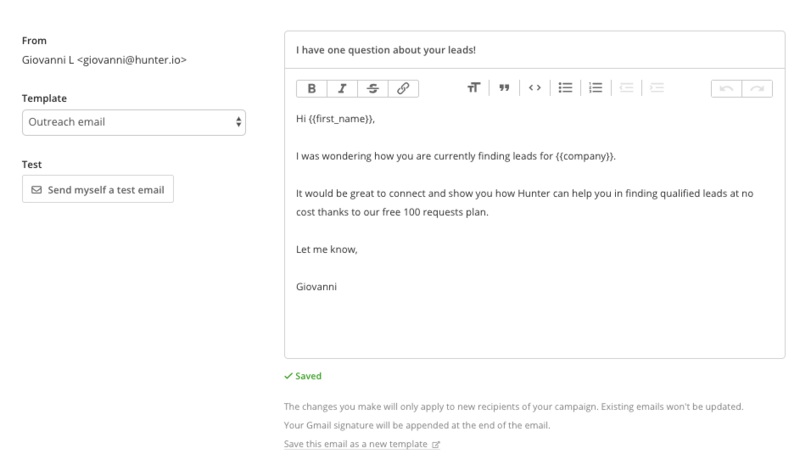 Hunter’s Campaigns feature makes it easy to create tailored email campaigns and monitor their performances in real-time at no cost. This not only saves you time, but makes creating targeted campaigns simple and easy to set up. After that, go to the Campaigns section and click the “+ New Campaign” button. In the email you can even include custom attributes (FIRST NAME, COMPANY, etc.) that are automatically filled when sending the email based on the lead's information. We recommend selecting two or more days in case you should need to send more than 400 emails. Please note that a campaign can contain 2000 emails maximum. Up to 400 emails will be sent immediately and the remaining emails in your campaign (if any) will be scheduled in the selected timeframe. activate/disable browser notifications when an email is opened, replied, etc. edit the signature for the emails. Messages sent: number of emails delivered. Messages opened: percentage of successfully delivered campaigns that registered as an open (the contact opened the emails you sent). Messages replied: number of replies received. 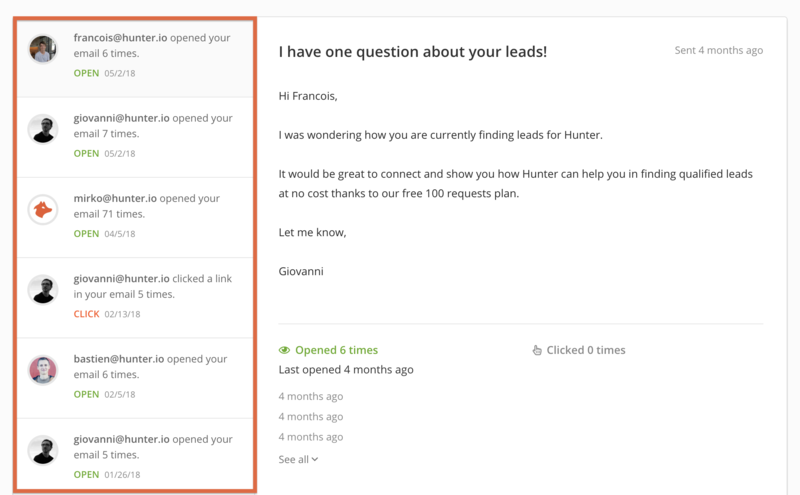 Tracking events are also displayed next to a lead in the Leads section and you can also set filters to find leads with a specific "sending status". 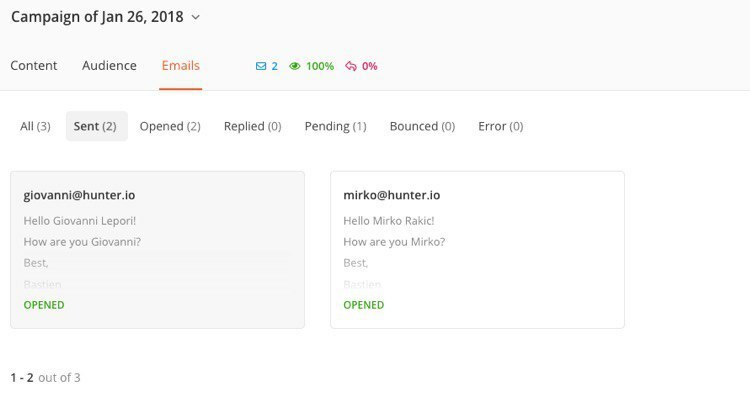 Outreach messages in a sent campaign can be filtered by status: emails sent, emails opened, emails replied, emails pending, emails bounced and errors. 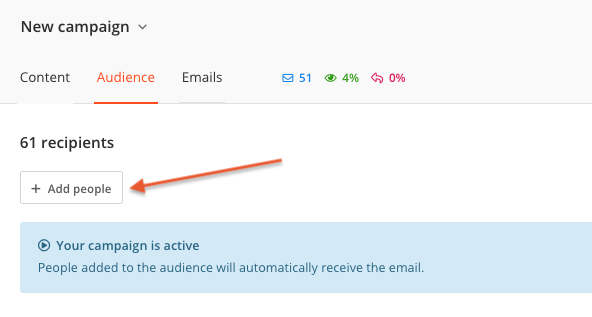 In the Last Activity section you can find an activity log with the chronological events (openings, clicks and replies) associated with the emails you sent. Simply click on an email to have a detailed report for it. In the Email templates section you can create new templates to use for your campaigns and edit or delete existing ones. Once a campaign has been launched and it is active, it is possible to automatically add new people to it. This allows to send the same message to new leads without creating a duplicated campaign. As soon as a new lead or email is added to an active campaign, an email will be automatically sent.